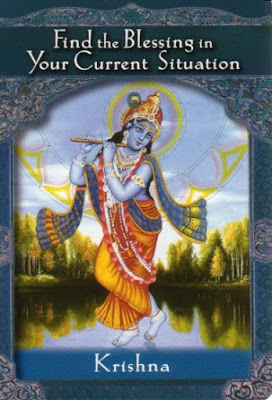 Ascended Masters Oracle Card for Today: Lord Krishna.A being who has become Self-Realized and serves humanity by raising his vibration to a sustained frequency of light. Card Meaning: “Every situation that you come across in life offers opportunities to grow and learn from experience. When we curse a situation or people, we block its energy flow and things fester and grow worse sometime. In contrast, as you recognize the hidden blessings within your current situation that you might be facing, supportive and healing energy flows towards you if you are ready to grow and learn with it. This beautiful card comes to you because there is an unrecognized blessing within your current situation from Lord Krishna. It could be something that you have learned or gained, for example acknowledge the blessing to accelerate the healing and manifestation that is trying to come to you. Additional meanings for this particular oracle card: Instead of worrying for the situation, pray and use positive affirmations to overcome it successfully. Know that everything is in Divine and perfect order. This situation is resolving itself perfectly. You can heal through the power of gratitude that you show towards what you have given bu universe. In Gita god says "He sees truly who perceive the Supreme God Krishna present equally in all creatures, the Imperishable amidst the perishing. He who is conscious of the omnipresence of God does not injure the Self by the self. That man reaches the Supreme Goal." If you are looking for guidance and consultations through tarot card reading, angel oracle card readings, lenormand card predictions for year ahead with regard to your career, matrimony, love, money or education then Divya Tattva is the right online authentic site for getting your report and affordable price.